Check out http://www.catactivitycentre.com for great information on cat activity centres, indoor cats and lots more! There are various different reasons why you may need to keep your cat indoors or you have brought/adopted one to be kept specifically indoors. These reasons may be due to the road you live near or other dangers outside your house or an illness or injury they have. For whatever reason a cat can live happily indoors if you make sure they have the right access to the things they would get outside. Of course I do not mean buy some birds for them to chase around the house, or plant a tree for them to climb up! Firstly your indoor cat needs to be given ample space in your house so that they can run around if they would like to and get all the exercise they need. If there is a room you do not want them to go in then keep that door shut instead of keeping them shut in the room. Give them access to windows that they can sit on and look out of so they can still watch birds and other animals and in the summer they can sit and sleep in the sun. You can get beds that latch on the window sills if you want to provide beds for them (see picture below) or they can just lay on the window sill if it is large enough. Provide your house cats with a variety of different sleeping places and areas. For example give them a couple of beds on the floor in different rooms, and provide a couple of beds at higher up levels. You can get radiator beds that hang off your radiator giving your cat a sleeping area off the ground as well as what has been mentioned about the window height access. If you allow pets on your bed, give them access to your bedroom as this will, for a lot of cats, become the main bed. You can also provide simple things such as a cardboard box as a bed as cats love boxes. When it comes to playtime make sure they have a few toys to play around with. The best thing to do is not go out and buy loads, as all cats like different toys and you might find you spend a lot of money and your cats do not play with half of them. Try out a few first and see what kind your cats like and then you know what type to buy. For example my cats love balls and catnip toys so I make sure that these are the majority of toys that are in the house. You can make your own toys too. Get a sock and fill it with catnip and tie a band round the top and this makes a great toyr for your ats to play with. 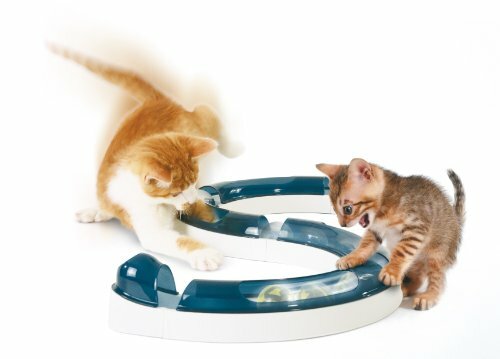 Also there are these catit Design Senses toys which are made to allow cats to use their senses they would normally use outside. Also all house cats should have a cat activity centre whether it is small or large as they will need a place to scratch as they look after their claws themselves, they provide places to sleep and a place to jump and play. Make sure house cats have a good diet. They may not need to be fed as much as outdoor cats as of course they are probably not walking or running around as much. You will find a lot of the time an indoor cat sleeps the majority of the day. This means you will need to assist with their exercise as well so they stay healthy. This can be done by getting toys that you can play with them with for example the toys that are a stick that you hold that have feathers etc attached to the bottom for them to chase or it can even be something you already have in the house like a piece of ribbon or string that you can get them to chase around the house. When it comes to food you can get pouches and hard food specially designed for indoor cats which provide them with all the nutrients they need but in a smaller quantity. House cats still need to be given a flea treatment monthly as fleas can be brought in from other sources so your cats may still get them if they are not treated. Also if you intend on having an indoor cat you may want to think about having more than one as then, when you are out of the house, they are less likely to get lonely and bored, and also if they play fight together and play with toys together they will get extra exercise which will keep their weight down and make them happy. They keep you company, warm in the winter and are great fun to play with. They just need to be given access to all the right things that will keep them happy and healthy.